How do you make more money than your competitors? That’s what Michael Porter set out to answer in his trilogy and what I’ll explain very briefly in today’s blog. You may remember Porter’s ‘Five Forces’ from school. He used this model to explain why some industries are more profitable than others. Ultimately, we can’t control our industry – but we can control the business that we’re in. And that’s why one of Porter’s lesser-known ideas is more actionable for most of us. 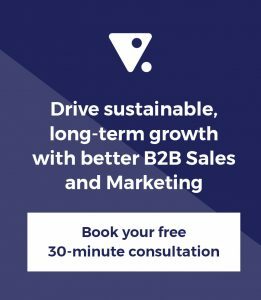 Increased profitability for your business comes down to deliberately choosing one of two strategies. Here’s your first strategy option: find a way to make it for less. I don’t mean sell it for less; sell it for market price, but find a way to make it for less than your competitors do. Now, the most obvious way to do that is scale. If you’re biggest, you normally get a scale advantage. However, there are other ways, and you need to go find the answer. Let’s look at a quick example. If the market price for a product is $100 and normally it costs $80 to make, everybody is making $20 or 20%. But, if you can make it for $70, ensure the same value to the market, and sell it for the same price, you’re going to be making $30. There you have it. 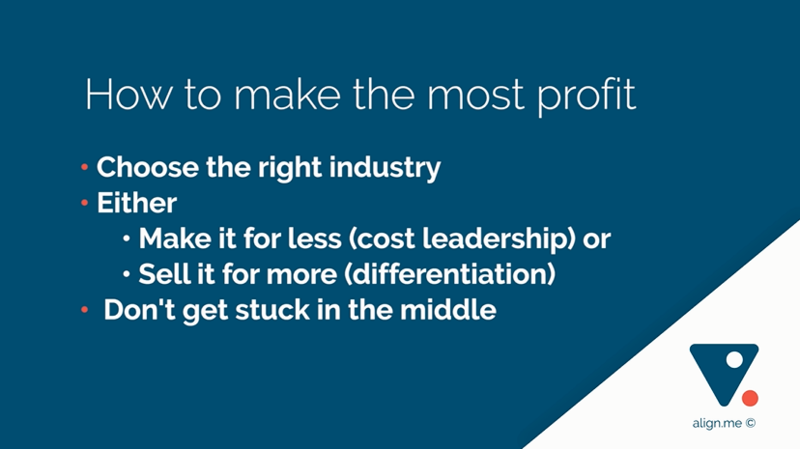 Cost leadership is your first strategy to help you make more profit than your competitors. The second strategy is to sell it for more. Find a way for your product to be considerably more valuable than others in the market so they choose to pay you a premium. Now, we marketers use the term ‘differentiation’ to mean, “Why will you buy mine”? However, Porter used the term to mean, “Why will you buy mine and pay more”? It works like this: if the going price for a product is $100, and it costs $80 to make it, then you need to find a way to spend $80 but make the product worth $110. Now you’re making $30. That’s differentiation – not why will you buy mine, but why will you pay more for mine? Let’s say the market has somebody who’s making their product for less, and somebody who’s selling their product for more, but they’re both making a $30 profit. This means the others in the market won’t be making $20 (the industry average). They will actually be making less because there are two other players in the market who are making considerably more. Let me explain this a bit more. We’ve set the industry average price as $100 and the cost as $80, but if you have somebody selling it for $110 and somebody making it for $70, then you’re there to make the numbers up. You’re either selling it for less than that or you’re making it for more than that. Long story short: you’re not making $20, you’re making considerably less. How do you make more profit than the others? Simply put, choose the right industry and then either make it for less (cost leadership) or sell it for more (differentiation). Just don’t get stuck in the middle. 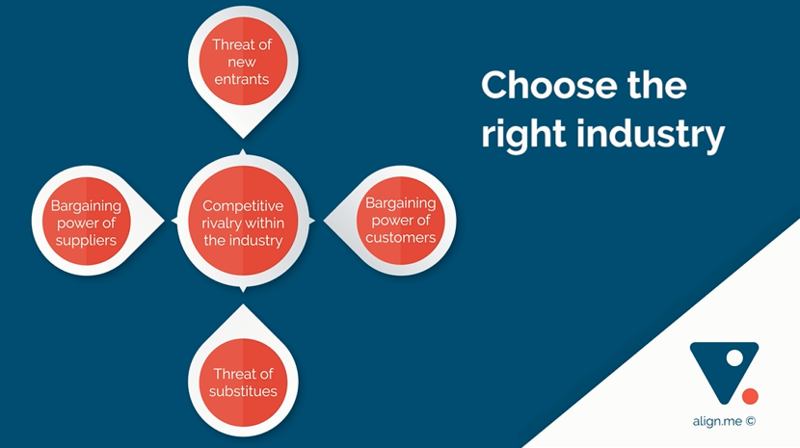 Most of our customers choose differentiation – that is, to find a way for their product to be worth more than others in the market. Now, if you’re going to do that you need the whole team to buy in. They need to understand how you create value – and where does that value come from? By solving the problem better than anybody else in the market does. That’s the job of the Funnel Plan. Get Sales, Marketing, Finance, and Operations together, agree on the problem you’re solving, how you’re going to solve it, and for whom. 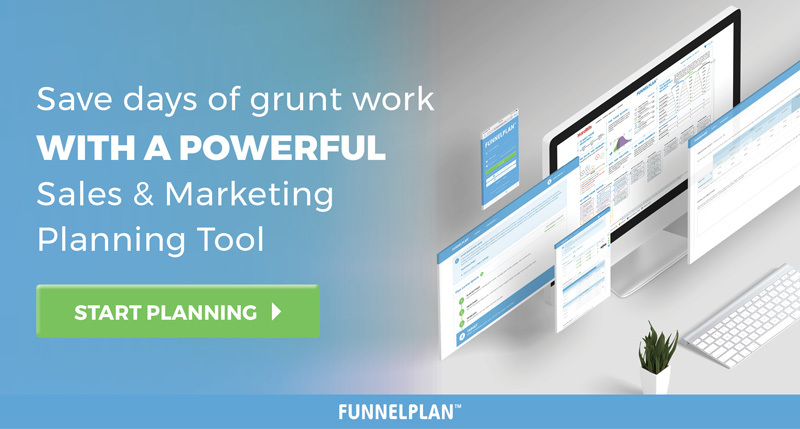 Now, if you have a Funnel Plan already, you know what I’m talking about. If you don’t, go get one at Funnelplan.com. I hope you got lots of value out of today’s Funnel Vision Blog. We’ll have a new blog next week, same time, and same place. Until then, may your funnel be full and always flowing.